The history of the Sabbath embraces the period of 6000 years. The seventh day is the Sabbath of the Lord. The acts which constituted it such were, first, the example of the Creator; secondly, his placing his blessing upon the day; and thirdly, the sanctification or divine appointment of the day to a holy use. 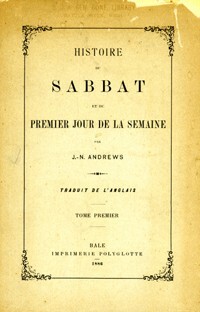 The Sabbath, therefore, dates from the beginning of our world's history. The first who Sabbatized on the seventh day is God the Creator; and the first seventh day of time is the day which he thus honored. The highest of all possible honors does, therefore, pertain to the seventh day. Nor is this honor confined to the first seventh day of time; for so soon as God had rested upon that day, he appointed the seventh day to a holy use, that man might hallow it in memory of his Creator. This is the French edition of the book.